Cilantro haters better quit reading right away! 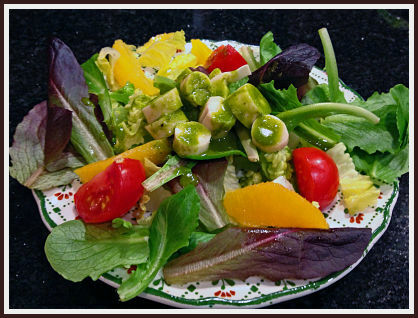 This is a salad for those of us who can take this gorgeous herb in all its green glory… Very tropical, very Brazilian with the addition of hearts of palm and oranges. Add the cilantro leaves, shallots, lemon juice, vinegar, and honey into a blender. Process until very smooth. With the blender running, slowly add the olive oil. Season with salt and pepper. Reserve. 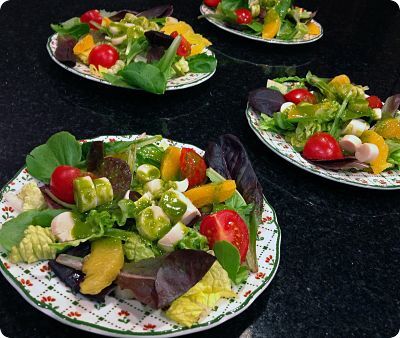 Assemble the salad on individual plates, making a bed of lettuce leaves, adding tomatoes and orange segments on top. Place the hearts of palm slices in the center, drizzle the vinaigrette all over. You should have vinaigrette leftover; it keeps well in the fridge for a few days. Hearts of palm always remind me of my maman, so this post brings an immediate smile. They’re so darn yummy too aren’t they? and I dare say underrated (at least I don’t come across them frequently in the blogosphere). Love your cilantro vinaigrette – what a colour! I don’t blame you for pre-assembling ;-). Shine indeed. Really nice Sally. I have a confession to make Sally.. He, he, he…. loved the “accidental bite of beet” – hearts of palm is a lot more “user friendly” – I don’t see how anyone would not like it. Very mild, nice texture… and quite good for you too. This récipe appears in the Food and Wine January 2006, in the article Latina Pop Stars, Carolina Buia and Isabel González. It;s a very interesting article, with lots of excellent recipes. Hearts of palm lend themselves to a variety of simple salads. At home I slice the hearts, tomatoes, avocado and red onion (optional). Can add cilantro if you like. Olive oil, a bit of vinegar or lemon juice, salt and pepper. This is a standby in Venezuelan steakhouses. Enjoy!